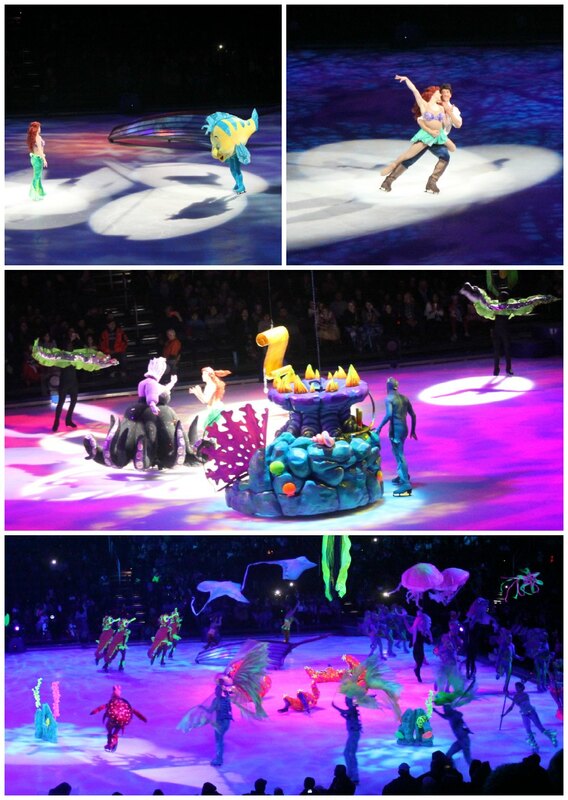 We had the plea­sure of attend­ing a performance of Dis­ney On Ice presents Rockin’ Ever After last night! The boys were so excited when I told them we were going, although they totally thought it was going to be a FROZEN show (since we listen to the soundtrack daily). 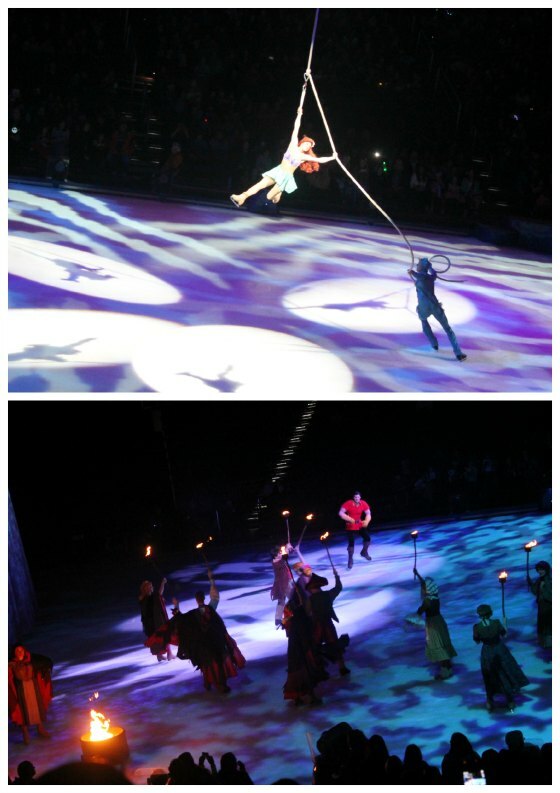 We had a great time at Dis­ney On Ice Dare to Dream and Dis­ney On Ice Trea­sure Trove, so we were excited to go again – especially since this show features the ice skating debut of Merida from Dis­ney•Pixar’s BRAVE! The boys LOVE Merida (especially so after watch­ing her join the Dis­ney Princess court at Dis­ney World), so they especially loved that part of the show! Isn’t that a cool shot?! I got lucky with the timing for sure! The boys loved the pyrotechnics in the BRAVE part of the show. But, really, there were some cool effects throughout – from an amazing arial routine from Ariel to the angry mob scene from Beauty & the Beast! Nothing like fire and ice! After an intro with Mickey, Minnie, Donald & Goofy, the show starts with Pinocchio and then the stepsisters from Cinderella Honestly, this intro could have been cut out to make the show just a wee bit shorter. We didn’t love the intro and it didn’t hold the boys’ attention well – likely because they’ve never seen Pinocchio. But, once the major story lines got underway, the show was really good! The first of the major story lines highlighted is The Little Mermaid. The “Under the Sea” performance was especially great in the neon lights! Next up was Tangled. 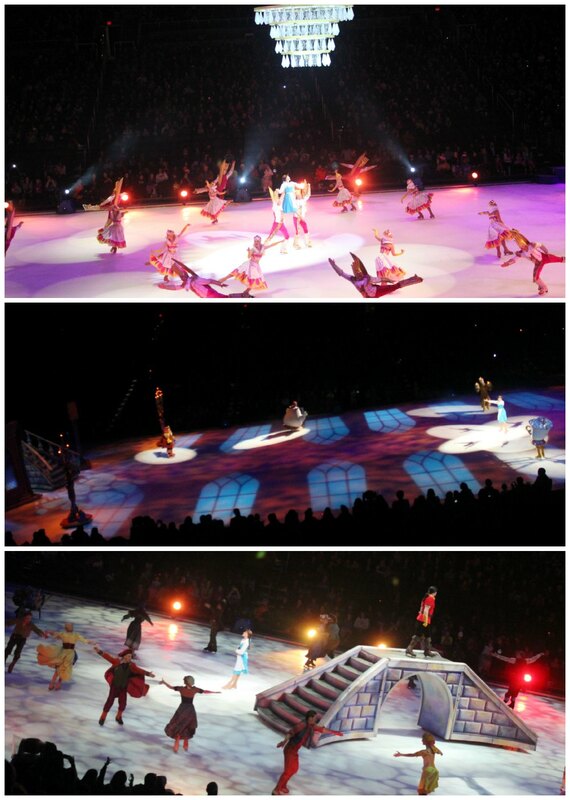 Even though it’s been part of every Disney on Ice performance that we have seen, the boys still really enjoyed it! The lanterns were especially pretty! After intermission was BRAVE, which was so fun! The archery scene on ice was so well done. And, I loved the music plus those great Scottish accents! This was the boys’ favorite part of the whole show! The last storyline represented was Beauty & the Beast. Gaston in this was a great skater! And, the effects were really cool! 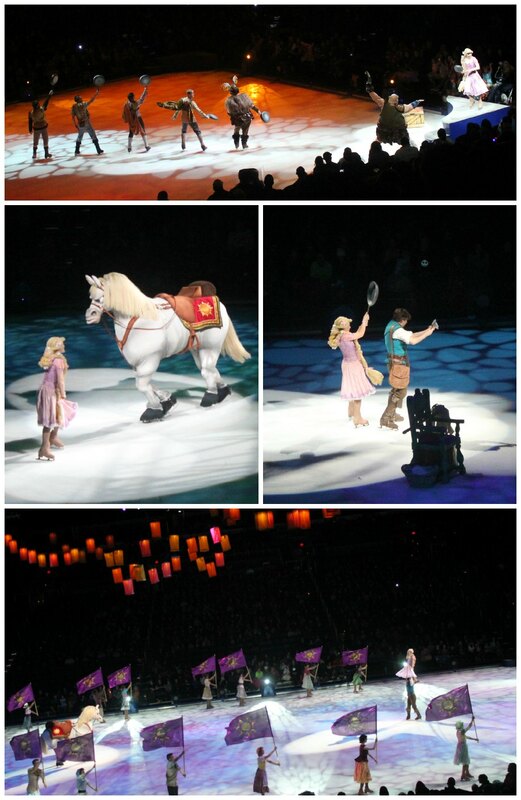 Just like the other Disney on Ice shows we’ve been to, this was a lot of fun. The boys had a great time, but it did get a little long. The show started at 7:00pm and we weren’t driving home until well after 9:00pm. My advice is to bring some jam­mies in the car and change before you head home! 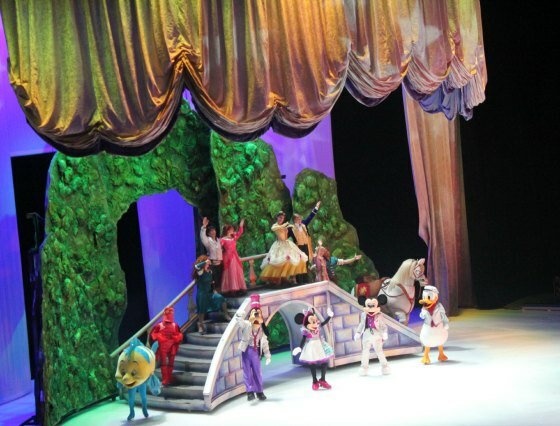 Disney on Ice presents Rockin’ Ever After runs in Phoenix through Sunday, January 12th. For full details and a ticket dis­count code… CLICK HERE! 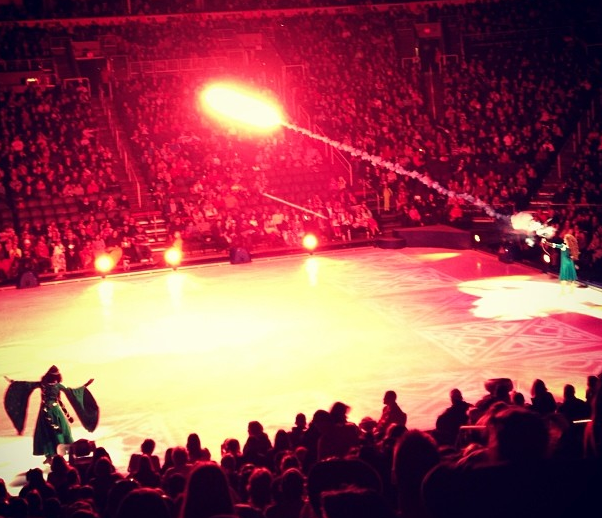 Have YOU seen Dis­ney on Ice’s Rockin’ Ever After? What did you think? Dis­clo­sure: I am a Feld Fam­ily Ambas­sador, in exchange for my time and efforts in attend­ing shows and report­ing my opin­ion within this blog, as well as keep­ing you advised of the lat­est dis­count offers, Feld Enter­tain­ment has pro­vided me with com­pli­men­tary tick­ets to Feld shows and oppor­tu­ni­ties to attend pri­vate Feld pre-Show events. As always all opin­ions are my own.